The Hound is the Minmatar Stealth Bomber. It is bonused for explosive torpedoes and bombs. 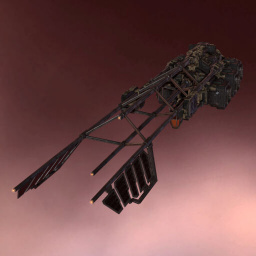 Stealth Bombers are mostly quite similar, but the Hound's unique selling point is its speed and agility, which makes it a good bomber, since it is more likely to make its escape after bombing. While the skills above will allow you to 'fly' the Hound it is pointless to fly a Stealth Bomber without a covert ops cloaking device (Cloaking IV), or torpedo launchers (Torpedoes I). Avoid using many TPs in big fleets because of stacking penalty. Consider upgrading launchers to polarized to increase DPS for the cost of EHP. Like all stealth bombers, the Hound is designed for surprise attacks against specific targets. A general guide to stealth bombers is available here. You can write additional notes for Hound here. Updated Minmatar Bomber Hound's sails pattern. The sails on the Hound are now transparent. Inferno To be released on Tuesday, May 22, 2012. This page was last modified on 9 July 2017, at 13:44. This page has been accessed 104,906 times.